While I was in talent acquisition and HR roles, I was often involved in strategy development for candidate attraction and retention. I would help my team come up with creative ways to attract talent, which could be especially tricky depending on the type of candidates we were aiming for. Once I started in HR and recruitment marketing, I realized that these were also hot topics when it came to developing copy for employer branding initiatives. Regardless of the role I was in, I knew the importance of brand marketing, effective recruiter communications and reputation damage control. Although these are all exceptional ways to help a company become an employer of choice, I believed that companies missed a step in the process. Sure, employer branding is great but you can’t truly make it strong if you have nothing behind it. To be an employer of choice, you must start from the inside and develop your employee value proposition (EVP). Having an employer brand isn’t going to be nearly as effective if your employee value proposition isn’t robust. Companies need to focus on developing this first before they can brand themselves in good conscious. 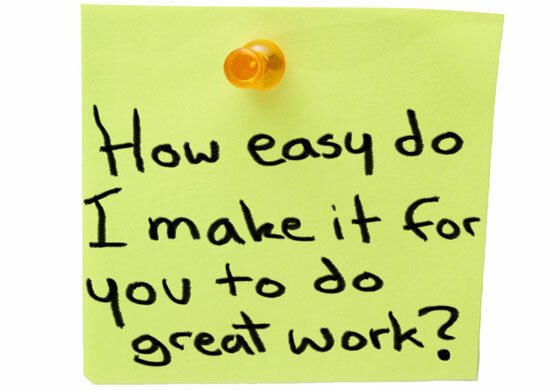 If your previous or current employees were to give a testimonial, what do you think they would say? What about the candidates that already interviewed with your organization? With technology making it easier for people to find news and reviews about your company or social media allowing candidates to communicate with employees, companies need to realize that they can’t just “fake it until you make it.” People will see right through it. Surveys: Give the people what they want! Getting candid feedback from your employees can help you understand what retains them, what things they value over others and what they’d like to see for future offerings. Also, get additional feedback from candidates. Learn more about what attracted them to your company to begin with and why or why not they decided to move forward with the interview process. Accumulating distinct details about attraction and retention can aid in the development of new offerings and nix the ones that make no impact. Competitors: Look at direct competitors within your industry to see what you’re up against. If a candidate is interviewing at multiple organizations, having this competitor intelligence can make it easier to seal the deal and help make your organization present itself as a stronger choice. Voluntary Turnover/Exit interviews: If an employee is leaving your company voluntarily, it’s in your best interest to find out why. Any information you gather from their exit interviews can be invaluable when it comes to knowing where your company is falling short. For example, did the employee leave because of the long commute? Incorporate telecommunication opportunities. Did they leave because lack of growth potential? Work with HR about career succession. Every exit interview can be an opportunity for improvement. Forecasting and continuous revamping: The world is fast changing, which means the landscape of employment, candidates and offerings will change quickly too. Employers need to focus on correcting or revamping their EVP for the here and now and they also need to stay on the forefront of what employees or candidates could want in the future. Staying ahead of the curve can limit any risk and make your talent acquisition strategy proactive. Revamping the EVP can keep it fresh and engaging. And, of course, branding: Once you get all the details of the EVP squared away, you then have a really strong backing to help with your employer branding initiatives. Your brand can speak to things you’ve already implemented and employees can give their testimonials to confirm that your company practices what it preaches. Showcasing your future initiatives and how you value employee and candidate opinions can make those researching your company more engaged and excited to see what’s to come. Your brand has to start from the inside. Before you can catch up with the trend of building a brand, social media recruitment, video branding and candidate experience, you have to make your employee value proposition into something worth talking about. What Are They Taking With Them When They Go? When I first considered human resources as a focus in college and as a career path, I always felt the intense desire to be that person that found the potential in others. I wanted to find that perfect person for a company’s needs. I wanted to find that connection and help companies discover a person’s hidden talents that may have been overlooked. I wanted to hone in on those aspects to a person, learn their passions, and help them foster it. I wanted to be the reason why a company had progressive employees. It wasn’t just about talent acquisition for me. It was about improving the internal team. These individuals weren’t going to be just another employee- they were going to be the people that made the difference. As I got more involved with human resources, I started to realize that in order to succeed, you had to build a relationship. As I thought of my own personal relationships in the past, I thought about the best and worst aspects of them. I recall growing up and having those highly emotional, yet highly destructive relationships. You know, the ones that you feel like you’ve just sunk yourself into a black hole and it will take forever for to build yourself up again. When I matured a bit more, I realized that all relationships don’t last forever and that the best thing I could do is to try to be supportive to the other person in the relationship. Let them build themselves up as an individual so if things didn’t work out, they wouldn’t be left with nothing. They wouldn’t have to start over again. I feel like these aspects are very similar to an employer/employee relationship. I’m sure we’ve all experienced some sort of negative situation: the employer didn’t care; you hit a glass ceiling; it was a hostile work environment; your employer was underutilizing you; and so on. I’m sure you’ve experienced the times when you were disengaged, dreading to go to work. I’m sure there have been times when you wanted to just give up because it didn’t seem like anyone noticed or recognized your efforts anyway, so why not put in the bare minimum. I’m sure there were also times when you had positive experiences. Maybe you still talk to your previous employers or coworkers. Maybe you also talk highly of them and would have stayed with them if they had the opportunities that matched your professional goals. As an HR professional, I’m wondering what we’re doing to change these employees’ experiences into a positive one. With the way the world of work has changed, it’s becoming a common trend for employees to move on from an employer within a few years, whether it is voluntary or involuntary. What are we doing to make them feel like they’re a better person and employee by the time they move on? Are we developing those relationships? Are we giving them the resources and tools they need to build themselves up? Are we utilizing their untapped skills so they feel like they’re making the most of their time and effort? I never wanted my experience in HR to be about “policing” employees. I didn’t want to be the warden of policies and disciplinary action. I didn’t want to be the one putting up so much red tape that employees felt stuck. HR has the ability to do something greater for their workforce. They have the ability to help with career progression. I want to know that my efforts impacted my employees’ lives so when and if they do leave the company, they are leaving with something more than what they came in with. Once again, #Tchat blew my mind last Wednesday as we discussed employee recognition. Were managers giving too little recognition or ignoring employees? Were they giving too much that it seemed insincere? Did the recognition tap into what employees wanted and needed or did it make no difference in their engagement? There were so many questions surrounding this topic and all of the contributors provided some great input, advice, and examples. First off, know your employees: recognition is a great thing but it’s even greater when you know your employees will respond in the way you were intending. Each employee is different and, therefore, their needs are different. Make sure your recognition would be appreciated by them. (i.e. if someone is an introvert, don’t put them on the spot in large crowds). Don’t get too crazy: we all love to be recognized for our hard work, but don’t go overboard. If you say thank you or get excited about EVERYTHING that EVERYONE does, it will start to lose its meaning. Make sure you keep it meaningful. Show a little faith: sometimes companies don’t have the financial means to provide a compensation reward, and that’s perfectly fine. But there’s other ways you can reward your employees. For example, allow them to take on another project to build skills and learn. Show them you believe in their abilities to do well and have faith in them. This can go a long way. Don’t shut out bad behavior: recognition doesn’t just mean positive praise. Sometimes you also need to recognize an employee for the bad, too. Don’t ignore them- help them! Ignoring these situations is just doing a disservice to them and your company. I’m sure they’d benefit from your recognition and help. Keep it unique: make an effort to go beyond a generic recognition statement. Take notice of what your employees individually do for your company and show your appreciation for their unique efforts. If you enjoy topics like this, be sure to join #Tchat on Twitter, Wednesdays at 7pm EST. With Baby Boomers heading out and Gen Y heading in, companies are starting to feel the pain of the generational differences in the workplace. Baby Boomers are known to be the loyal generation and would typically stick with their employer for many years, if not their lifetime. Gen Y seems to have a different plan in mind in the sense that they’re looking for a job that is meaningful and a company that has a culture that matches their personal values. In the pursuit to find these ideal employers, it has been a common practice for this generation of employees to leave their employers within the first two years. So how can you increase employee engagement to create a sense of loyalty? Simple—you must brand your company. Your employees will become your megaphone: I’m sure you’ve heard that word-of-mouth is your best referral/advertising campaign. Consider your employees as free advertisement for your company. Give them a good or bad experience, and they’ll be blasting that information all over social media, telling their friends/family, and so on. How will what they say affect your business? Give them a good experience and they’ll be sure to tell others about it. Allow your employees to be internal brand ambassadors: It is extremely hard to fake conviction. Therefore, if you have employees meeting new hires, it is important to have them meet the individuals that truly love and believe in your company to really get your new hires excited about working there. Setting that first impression is key in employee retention. Make an investment to get a great ROI: Investing in your employees is very important. Your employees want to feel like they matter, that they’re being heard, and that they have a future in your company. This investment will make them truly respect you, want to be dedicated to you, and want to work hard so you’re proud of them. This loyalty and dedication can be a good way to retain employees long-term. Branding leads to employee engagement: Employee engagement is one of the hardest things for HR professionals to master in their organizations. However, if you create a brand that gets your employees excited to work for you, then engagement will come naturally. Employee engagement can increase levels of motivation, productivity, empowerment, accountability, and responsibility. Company branding should be more than just the external. It should also seriously focus on the internal. After all, your employees are everything. They help you progress, innovate, and be successful. If you aren’t able to successfully and effectively brand in a way to attract and retain talent, then you may have issues down the line. As I’ve been conducting my research to find resources for my daily blog posts, I seemed to be spotting the word “gamification” popping up more and more. I became intrigued once I saw this term trending on a more regular basis and finally decided to investigate what all the hype was about. I had figured that it had something to do with video games or gaming of the sort, so you could imagine my pleasant surprise when I learned that it was much more than that. Gamification does involve some of the structure and competitive aspects of games, but this trend is used to help increase employee and/or customer engagement. Needless to say, the topic was perfect for my post today. Recruiting: Companies have created games that are similar to Facebook’s Farmville or The Sims, but customized a structure that is relevant to the company and job function. The idea is for candidates to virtually display their abilities to multitask, perform job functions, and handle unexpected issues. Recruiters are able to see the candidates’ activity and distinguish which individuals clearly display the competency and experience needed to successfully perform the job duties. It is considered to be a virtual way to “test drive” candidates before hiring them. Employee Engagement: Gamification can tap into employees’ competitive side which will increase their motivation to do certain tasks. This can also help employees be more engaged while doing boring, mind-numbing functions. In addition to motivation, this tool can allow employees to collaborate easily and work as a team towards organizational goals. Collaboration can help employees build relationships with one another which will also increase employee engagement. Recognition/Rewards: Gamification can allow managers to see which employees are putting in the effort and also determine which employees have the qualities that are worthy of reward or promotion. This can give all employees an even playing field instead of allowing the more outgoing employees to have the upper hand in catching management’s attention. On the other hand, if a company does not have the resources for monetary rewards (which can be common with the downturn of the economy), gamification can give employees awards and recognition. Even a simple thank you or virtual award can go a long way with employees. Health/Wellness Programs: Gamification can be a fantastic way to get your employees on a healthier track. For example, I worked at a company where majority of employees sat through their shifts and obesity and health issues were becoming a problem. The company started a contest where employees were to set exercise goals and log their workouts on an online website for three months. At the end of the contest, the individual that lost the most weight and/or inches would win an iPad. Employees loved this contest. Even if they did not win the prize, they still felt like winners because they had now made a workout regimen routine and were seeing results. Gamification can help make HR professionals’ jobs a lot easier and also provide some great benefits for employees. Employees will feel happier going to work, can grow professionally, prove that they’re worthy of promotion, and can even help their health. I suggest that more companies take a look at which “games” would be useful to their company and test it out. The results may be interesting! Forbes: Gamification: Three Ways To Use Gaming For Recruiting, Training, and Health & Wellness. Employers and Brands Use Gaming to Gauge Engagement.